She is one of the most beautiful actresses ever to grace the silver screen. Her career spanned half a century, and she starred in many unforgettable movies. But for all the success she had on screen, she suffered through much personal tragedy off screen. 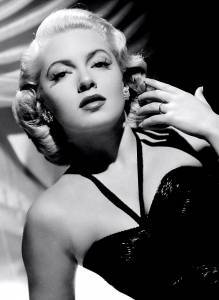 Lana Turner enjoyed tremendous success in the movie industry and became one of Hollywood’s biggest stars. But her highs on screen were matched by devastating lows off screen. Turner suffered through many personal tragedies and failed marriages in her quest to find happiness. She also struggled for a long period with alcoholism and smoking, both of which led to the throat cancer that would take her life. Lana was born Julia Jean Mildred Frances Turner on February 8, 1921. She was born into a working class family in the town of Wallace, Idaho. Though her parents did not have a lot of money, Lana had fond memories of the music they would play after dinner. Her parents loved music, and the family would sing and dance each night to the records they played. Lana’s father worked as a coal miner at a local mine. The work was hard, and he did not make much money. To supplement his income, he would play cards. He was an excellent card player, and often he won money that he used to buy things for his family. On his way home one night after doing very well at the card table, Lana’s father was robbed and murdered. When Lana was a teenager, she and her mother moved to Southern California in search of better job opportunities. Lana found her escape from hardships in the cinema. She would save a nickel of her lunch money every day so that she would have 25 cents to go to the movies on Saturday. She loved the beautiful costumes and jewelry actresses like Kay Frances wore, and she found herself wanting to wear the same wonderful clothes worn by her idols on the big screen. Not long after moving to California, she was approached by W.R. Wilkenson, a magazine publisher, and asked if she was interested in acting. She was soon introduced to Mervyn Leroy, who cast her in his upcoming movie. Before he cast her, he thought she needed a catchier name. She suggested Lana, and he agreed. In They Won’t Forget, Julia, now Lana, played the small part of a schoolgirl. Though the part was insignificant, critics were impressed with her ability and she received good reviews. This part also produced her nickname, “The Sweater Girl,” because of the tight blue sweater she wore in the movie. Critics liked the schoolgirl in the blue sweater, but Lana did not think this part would lead to a career. She remembers, “I made my first movie without ever considering that my walk-on would be anything more than a one-time job.” But Leroy also cast her in his next movie, The Great Garrick. After this film she went to work for Samuel Goldwyn and starred in The Adventures of Marco Polo. In this film Goldwyn wanted Lana to shave her eyebrows for the part, which she did, but her eyebrows never grew back. For the rest of her life, Lana had to pencil in her eyebrows. When Leroy went to work for MGM Studios, he took the twenty year-old Lana with him, and her career took off. She was soon making a large salary, and one of the first things she did was to buy her mother a new house where they both could live. Her career flourished, and she was soon making important movies and making big money. Included in her many hits are classics like The Postman Always Rings Twice, The Three Musketeers, The Bad and the Beautiful, Homecoming, Peyton Place, Madame X, and Imitations of Life. Using her newfound fame, she helped raise money for the U.S. effort in World War II. Lana went on railroad tours to sell war bonds. She wrote her own speeches and promised “a sweet kiss” to any man who purchased a bond worth $50,000 or more. “And I kept that promise-hundreds of times,” she said. “I’m told I increased the defense budget by several million dollars.” Her pin up photograph was a favorite with GI’s the world over. But her personal life was not as happy as her career. Lana’s personal life was scandalous to say the least. She liked men, and was never shy about admitting it. She was married seven times. She first got married when she was twenty years old, and the marriage lasted less than six months. She did not have much luck with the next six marriages either, with most of them lasting less than two years. For eight hours she was briefly engaged to Howard Hughes. Lana also had the misfortune of dating a man named Johnny Stompanato, who hid his identity as a small time gangster and associate of Mickey Cohen. One evening, he and Lana got into an argument and Johnny threatened to hurt her. Lana’s fourteen year-old daughter Cheryl Crane, was outside the room listening, and went into the kitchen to get a butcher knife when she heard the threat. As Cheryl was walking into the room with the knife, Johnny was storming out, and Cheryl stabbed him in the chest and killed him. The incident caused a major scandal and threatened to damage Lana’s career. Lana’s sense of style set trends. During her reign as First Lady of Argentina, Eva Perón patterned herself after Lana, in particular she copied Lana’s hairstyles, makeup and tailored suits. Lana did not only have problems in marriage. She also had a long battle with alcoholism and was a chronic smoker. She smoked so often, that her cigarette was often airbrushed out of her photographs. The drinking and smoking led to a diagnosis of throat cancer in 1992. She went through eight weeks of painful radiation therapy for a malignant tumor. In 1993, Lana announced that her cancer was in remission and she was fully recovered. She soon returned to the public eye and was seen at the big celebrity functions. Her daughter Cheryl also announced that Lana had finally quit smoking. But her choice was too late. Lana’s cancer returned, and her jaw and neck became severely swollen. Typical of patients with oral and throat cancers, she began to have trouble eating and her weight dropped to 92 pounds. Soon the cancer became so bad that Lana had to be fed through a stomach tube. Her weight dropped to 85 pounds, and she was in great pain. She retreated completely from the public eye. On June 29, 1996 at the age of 75, the oral cancer got the better of Lana, and she died at home with her daughter at her side. “It’s said in Hollywood that you should always forgive your enemies – because you never know when you’ll have to work with them.